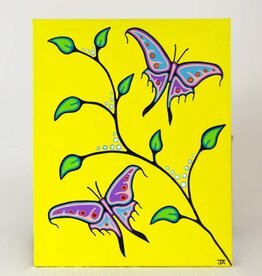 I was born in Etobicoke, Ontario and from an early age had a strong connection to Norval Morrisseau’s Woodland style. I began to study his work in depth from about the age of 15. Soon after I travelled back to my roots in Norther Ontario, and believe the Creator brought me together with Norval and some of his close family. At the age of 17, I was blessed to spend time with Norval himself. I was incredibly inspired by his art but would not realize my calling for many years to come. 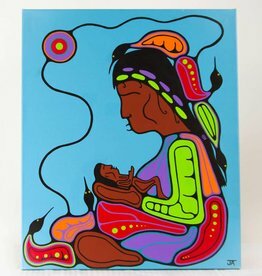 After moving to North Vancouver in 1991, some years passed but my connection with Norval’s art and my Ojibway culture stayed strong. After Norval chose to share his gift with his nephew, some time passed and his nephew decided that I too was being called to paint this amazing style. I was not sure I had the talent to paint. Then, several years ago, Norval came to me in two very powerful dreams. He stood behind me as I painted and was giving direction and guidance to me. I awoke and knew in my heart that it was time to pick up the paint brush again. 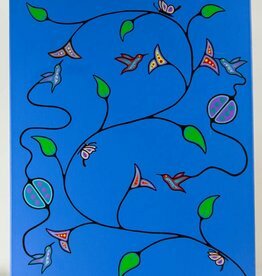 Every since, I have been painting with beautiful bright colours in the style that was taught to me. My inspiration and strong desire is to bring healing and joy through colorful images, passing on teachings and stories that have been passed to me.